3. Thermal Conductivity: high temperature: 1600 degrees below the ideal heat insulating material of high voltage and high frequency equipment. Alumina ceramic is al2o3 as main raw materials, in the rare metal oxide as flux, special ceramic sheets after one thousand degree high temperature roasting into. Alumina ceramic al2o3 content is high, the structure is relatively compact, with special properties, it is known as the special ceramics. 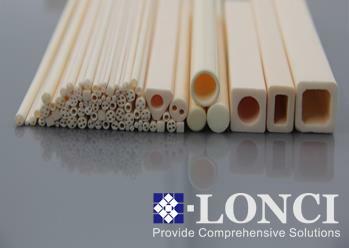 The al2o3 ceramic materials are densely arranged six party structure for oxygen ion amd aluminium ion, filled in 2/3 with eight sides in the gap, which is the same with natural corundum stable alpha al2o3 structure, so the ceramics with high melting point, high hardness, good wear-resistance.